The "Lastochka" Hotel, set in the Zapadnaya Polyana district, stands overlooking the vast panoramic view of the central city area. Accommodation for 160 people is available at the hotel's 70 guest rooms, including Single, Double and Triple Standards as well as Junior Suites and Family rooms. All rooms are complete with comfortable beds and necessary furnishing, TVs and fridges. Junior Suites and Family rooms feature additional amenities for added comfort. The "Lastochka" restaurant serves courses of Russian and European cuisines in a pleasant setting. The hotel's restaurant and banquet hall are suited for hosting festivities, weddings, anniversaries and corporate parties. The on-site conference hall, seating 250 participants, can host a variety of events of city and district scale. Business guests can avail of numerous business services, making it easier to arrange and host business meetings, seminars and conferences. 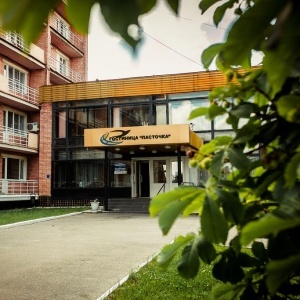 Additional "Lastochka" Hotel facilities and services include a hairdresser's salon and sun bed, taxi service, long-distance and international phone calls, daily necessities shop and tourist agency services.